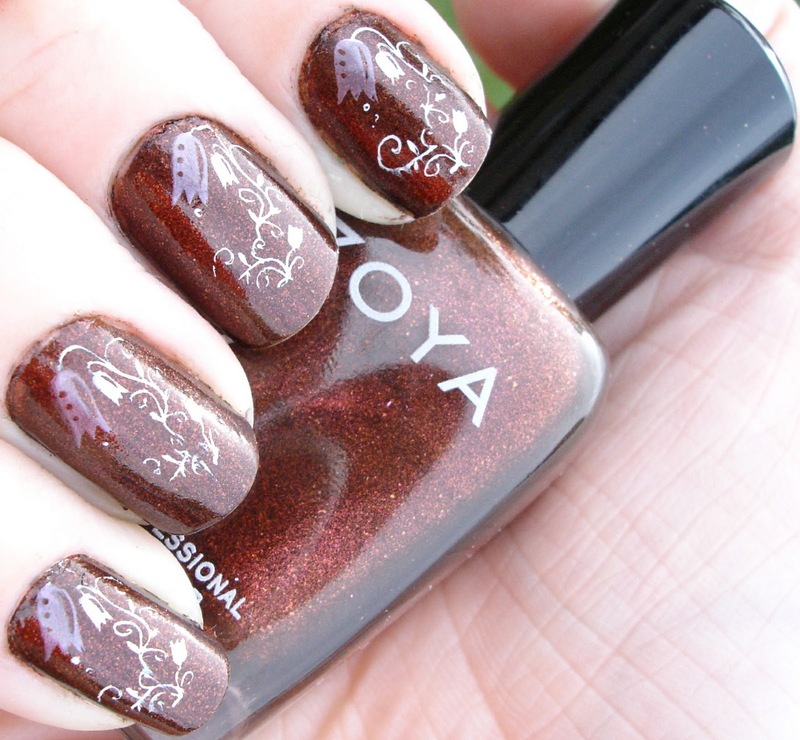 When I first saw swatches for Zoya's Wicked and Wonderful collections, I knew that I needed Cheryl. First off because it is completely gorgeous, and second because it is my Mommy's name! I was thrilled when I got it in the mail last week and even more so to try it out. I also tried something a bit different with Konad this time - I used two colors on one stamp pattern, and I think it turned out very pretty. 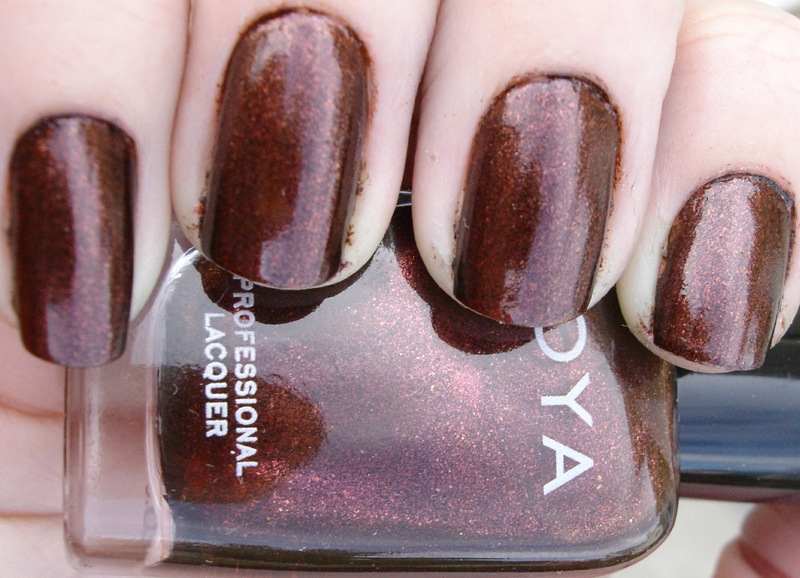 For these nails, I started off (after base coat) with two coats of Zoya Cheryl, which is a gorgeous chocolate-bronze polish with a sparkly almost metallic finish in the sun. It is simply stunning, and coverage was great - one coat was almost opaque but I needed the second for just a touch of bare spots here and there. Application was fairly smooth, dry time decent and it is beautiful! I have included some pictures of Cheryl by itself near the end of the post. I decided to try something a bit new with Konad as well this time. 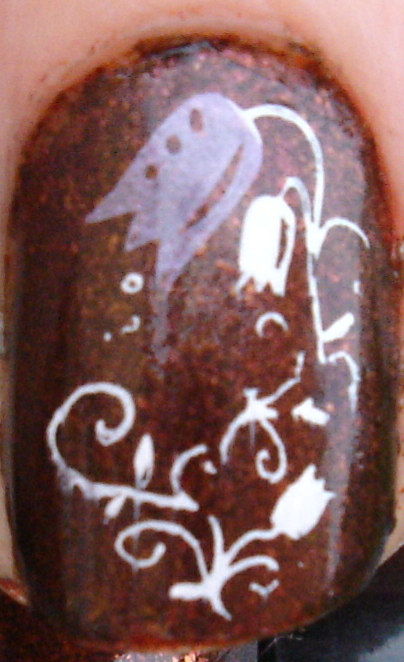 Using plate m54, as well as Konad Special White and Ulta Lilac Chrome, I stamped a multi-colored tulip pattern onto the nails. I was a bit worried whether I would be able to pull it off or not at first, but it worked out really well. 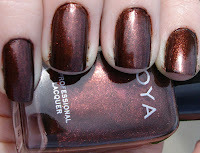 Here are a couple of pictures of Zoya Cheryl by itself. This is a seriously beautiful color! Have you ever done multi-color Konad designs? If so, I would love to see them! Post a link in the comments below if you'd like to share! Also, I will be starting up a new giveaway very soon, so be on the lookout. Hope you have a happy Monday.